The self-described family-friendly B.C. Liberal government is facing mounting political and social challenges to offer better care to vulnerable people and their families. Ministers have been dumped, bureaucrats fired and reviews announced, but the calls to spend more money and improve services for adults with developmental disabilities keep getting louder. Even members of Premier Christy Clark's own government have spoken out, saying people are suffering and the government isn't doing enough to help. "What's at the heart of this is that we've got families who are feeling they are not receiving the supports that they need and people who are feeling at risk and vulnerable," said recently appointed Social Development Minister Stephanie Cadieux. "That is just not appropriate and not OK," she said. "This government and I want to make sure that people know that they can count on the support that they require from government." Cadieux, appointed minister last month after the cabinet demotion of former minister Harry Bloy, said she wants to get to the bottom of the problems facing Community Living BC, her ministry's Crown agency that delivers services for vulnerable people. Cadieux's plans to strengthen the care agency come after a particularly rocky period for her ministry and the government on the family file. Two Liberal backbenchers, Abbotsford-Mission MLA Randy Hawes and John van Dongen, Abbotsford-South, publicly stated the Liberals were not doing enough to help families who were suffering due to the lack of government help. "In the over 10 years that I've been in this legislature, there's no issue that's caused me more loss of sleep or more concern for those most vulnerable people," said Hawes during debate on an Opposition New Democrat private member's bill calling for a halt to the closure of group homes. "We need to act now," he said. The New Democrats and family and social advocacy groups have been calling for an independent review of CLBC operations. Recently, CLBC chief executive officer Rick Mowles was replaced by Doug Woollard who acknowledged the agency made mistakes and did not always consider the needs of its clients first. Woollard's admission comes after months of complaints by families that government closure of more than 60 group homes caused serious concerns for the families and distress for the developmentally disabled clients. Cadieux said her ministry has initiated two separate initiatives to offer immediate and long-term service improvements for people. A financial audit seeking to find efficiencies that ensure families receive better service is underway. On Friday, Cadieux ordered the CLBC board to stop paying bonuses to managers after reports that some staff were paid what amounted to about $300,000 in bonus payments. Cadieux said she's also set up a client-service team to quickly deal with concerns about service delivery. The team has a toll-free number: 1-877-660-2522. "This is in response to the fact that we recognized that there were significant challenges that were being brought forward," she said. "We decided we better take a serious look at what was going on. We want to make sure that we're serving families the best way we can." Earlier this month, Cadieux said there were almost 3,000 people on a CLBC waiting list asking for more help. Of that number, 750 people were waiting for service to start. CLBC has about 14,000 clients. In September, the government added almost $10 million to the social development ministry's budget, bringing the budget total to $710 million. Cadieux said she couldn't guarantee any further budget increases, but CLBC and social groups have both said at different times that the ministry needs between $65 million and $70 million to clear wait lists. 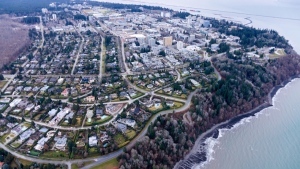 University of Victoria social policy expert Michael Prince, who also speaks for the coalition of family groups lobbying the government to improve services, said Cadieux and the Liberals sound like they are trying to make the CLBC issue go away, but it will take more than money. "There's a crisis here of confidence and public credibility," said Prince. "This is maybe a quick response to what is being viewed as an emergency or a short-term political crisis. But it's more systemic than that."